Scott Pruitt seems like the kind of guy who would dunk his first born in toxic waste just to demonstrate that it would survive. Still, his decision to reject a ban on a popular pesticide that’s been shown to harm children’s brains was a little surprising. On Tuesday, we found out that a cozy relationship with the pesticide’s manufacturer may have influenced his thinking. What is this Toxic Chemical Scott Pruitt Wants to Keep in Your Food? On March 29th, the EPA administrator rejected a petition from the Pesticide Action Network North America (PANNA) and the Natural Resources Defense Council to ban chlorpyrifos. The organophosphate pesticide has been in use since 1965 and in recent years, scientists have demonstrated repeatedly that it has negative effects on the development of children’s brains. 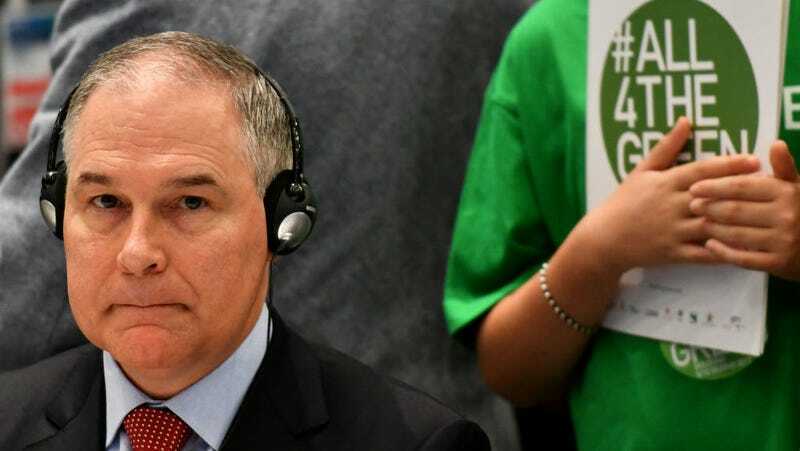 EPA spokeswoman Liz Bowman said Tuesday that Pruitt was “briefly introduced” to Liveris at the conference. Though his schedule for the intervening months has not yet been released, Bowman said Pruitt has had no other meetings with the Dow CEO. There was a larger group meeting that Pruitt attended which also included two other Dow executives, but she said that didn’t involve chlorpyrifos. You can tell which one’s him because he’s the guy being handed the pen. Trump handed him that ceremonial pen after signing an executive order stating that for every new regulation created, two had to be eliminated. According to the AP, Dow also donated $1 million to Trump’s underattended inauguration. Asked to respond, EPA spokeswoman Liz Bowman said, “Despite several years of study, EPA has concluded that the science addressing chlorpyrifos remains unresolved.” At a hearing on Tuesday, Senator Tom Udall pressed Pruitt to offer any peer-reviewed evidence that the pesticide is safe. That’s not really his style and he pivoted to saying that he based his decision on “interagency dialogue” with USDA. He could have just asked the scientists in his own agency, but he’s been rapidly purging them from the ranks.